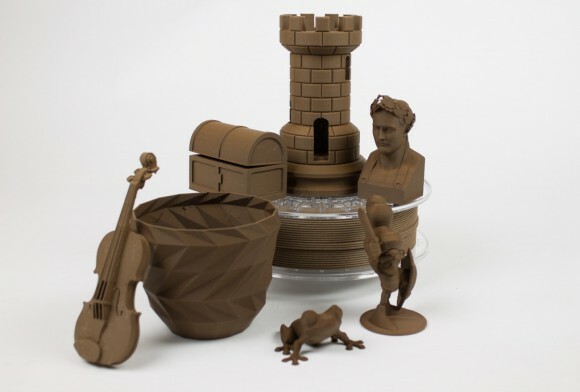 The European 3D printer filament maker ColorFabb has announced a new wood-type of filament called corkFill and as the name implies it is should offer characteristics similar to that of cork as the filament is a mix from cork and ColorFabb PLA/PHA filament. The new ColorFabb corkFill filament is already available for pre-order on the official website in 650 gram spools for 39.95 Euro in both 1.75mm and 2.85mm versions with shipping expected to start next week. The sample photos provided by ColorFabb show a nice detail level and good looking color results in general for prints made with the new filament. Since is is based on the PLA/PHA filament it should be easier to print and not require Heated Build Platform (HBP) to be present on your 3D printer to use it. The recommended settings for using the new corkFill filament from ColorFabb are printing temperature of between 210 and 230 degrees Celsius, print speed of 40-60 mm/s and if a HBP is present to use a temperature of 50-60C for the bed, though as mentioned you should be able to print on cold build plate as well. ColorFabb also recommends that for stronger prints and better reliability you should increase the flow rate with about 4-10%, depending on the printer you are using. We are expecting good results from the new corkFill as so far we’ve been pretty pleased with the results we have achieved using different ColorFabb filaments for our MakerBot Replicator 2 3D printer. We have tested multiple of the more exotic filaments that the company makes and have a few more waiting to be tested and we are certainly also going to give out a try of the new corkFill filament as well when it becomes available.